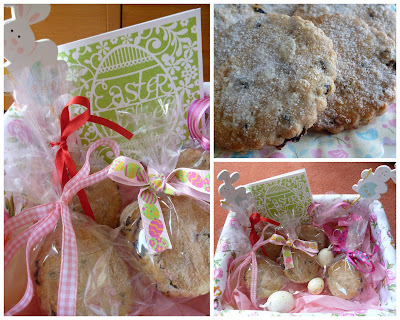 Easter Biscuits are a great treat and an alternative gift to chocolate eggs. My Easter Biscuits recipe are all baked, gift wrapped and ready to be delivered in my new hamper on Easter Sunday, just need to get my bunny ears out of the cupboard. Sift the flour, salt, and spices into the butter and sugar mixture. Place them onto a lined baking tray and bake for 10 minutes oven temp 200 degrees. 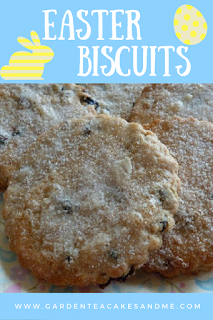 Remove them from the oven and using a pastry brush carefully brush each biscuit with egg white and then sprinkle with caster sugar. Love this recipe - Pin me on Pinterest! I'm entering my Easter Biscuits into March's Calendar Cakes baking challenge hosted by Laura from Laura Loves Cakes and co-hosted by Rachel from Dolly Bakes. The theme this month is Easter Extravaganza - yes I know these are not technically cake but they have the same ingredients (almost!). YUM!!! Looks soo good!!! Hope you had an amazing Easter!! Im following along with BlogLovin!! They look lovely, far nicer than mine turned out. But they did taste good. I do like a traditional Easter. These look lovely, and so well presented. My baking always looks a bit haphazard but tastes nice!